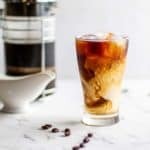 Enjoy a delicious iced coffee this summer and save money by learning how to make cold brew coffee. 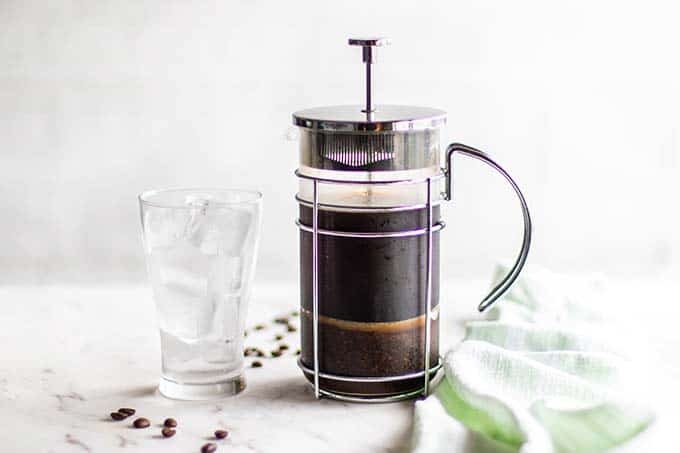 For the best glass, the recommended Cold Brew Coffee Ratio is explained, so you can choose to enjoy your coffee on ice, heated, or as a latte. 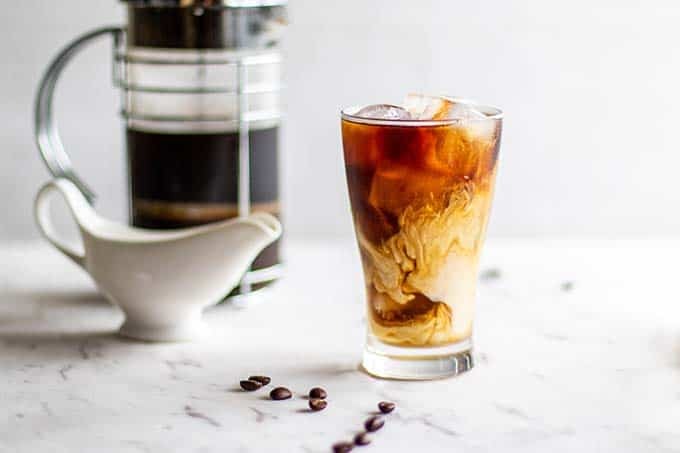 You’ll find that having cold brew concentrate ready to go in the fridge makes summer time iced lattes so easy! Cold brew coffee is all the rage at coffee shops these days! And in the summer, it certainly always sounds refreshing. 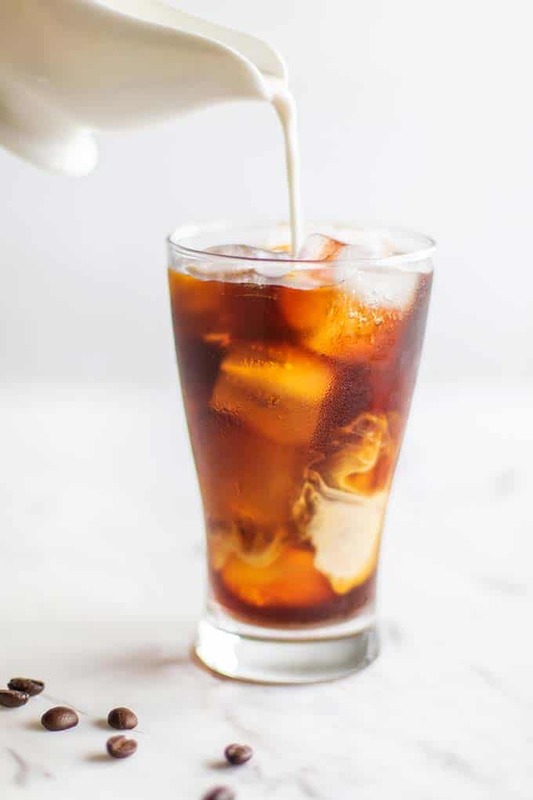 I make cold brew often at home — it’s very easy to make, so I like to always have some in the fridge for when my coffee cravings hit (which is often!). Cold brew is different from ice coffee. Iced coffee is simply brewed coffee that has been cooled, and then poured over ice. Cold brew coffee is slowly brewed in cold water, which results in a smoother cup. While iced coffee needs to be brewed fresh, cold brew coffee tastes great for a week if refrigerated. Another thing to note about cold brew is that it has a higher caffeine content than regular brewed coffee. A typical cup of joe has 95 mg of caffeine, while the same sized cup of cold brew varies greatly depending on the ratio of coffee to water, but it can range from 100-200 mg. of caffeine. I am sensitive to caffeine, so while I love my cold brew, I choose decaf coffee. I find that cold brewing decaf improves it’s flavor, so it’s a great option if you are also senstitive to caffeine, are enjoying this later in the day, or just like to keep caffeine at a minimum. My favorite decaf coffee comes from Strictly Organic, and I always pick up a few bags while I am back in Bend in the summer. The coffee is organic and fair trade certified, and it’s a great option for decaf because it uses water processing instead of chemicals for the decaffeination process. The first time I tried to make cold brew, I was sorely disappointed with the watery brew the next day. Cold brew coffee requires twice the amount of coffee as in typical drip brew. The cold brew coffee ratio also changes depending on how you’d like to use it. I most often drink my cold brew with just coconut milk as a creamer, and drink it over ice. You can also reheat cold brew and enjoy it hot, but you need more water for that, since ice won’t be melting and watering it down. 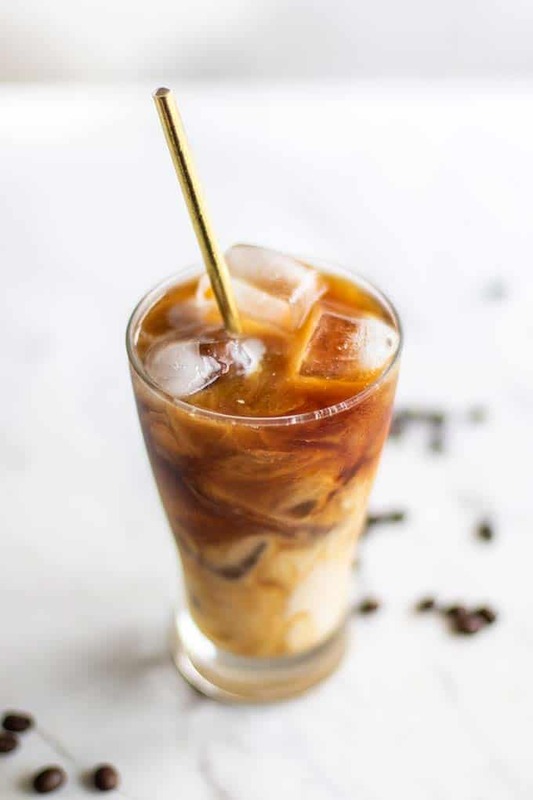 Another option is to brew extra strength cold brew and then mix it with milk, almond milk, or other non dairy milk of choice to make a latte or flavored coffee drink. Cold Brew to Pour over Ice: use 1 ounce of coffee beans per 1 cup of water. I typically make 3 cups of coffee, so I use 3 ounces of coffee beans. Cold Brew to Reheat and Enjoy Hot: use 1 ounce of coffee beans per 1.25 cups of water. This is 3.75 cups of water for 3 ounces of coffee beans. Cold Brew Concentrate for Iced Lattes: use 1 ounce coffee beans per .75 cups of water. This is 2.25 cups of water for 3 ounces of coffee beans. *3 ounces of coffee beans is a heaping cup full of whole beans. Cold brew concentrate is great to make if you’re looking to use coffee as a substitute for espresso in a recipe. It’s also a great option if you’d like to enjoy a homemade latte. Step 1: Determine the cold brew coffee ratio you need for your purpose. Then, decide how much coffee you’d like to make. Cold brew stays tasting fresh for up to a week, so making a large batch of cold brew is a good idea! 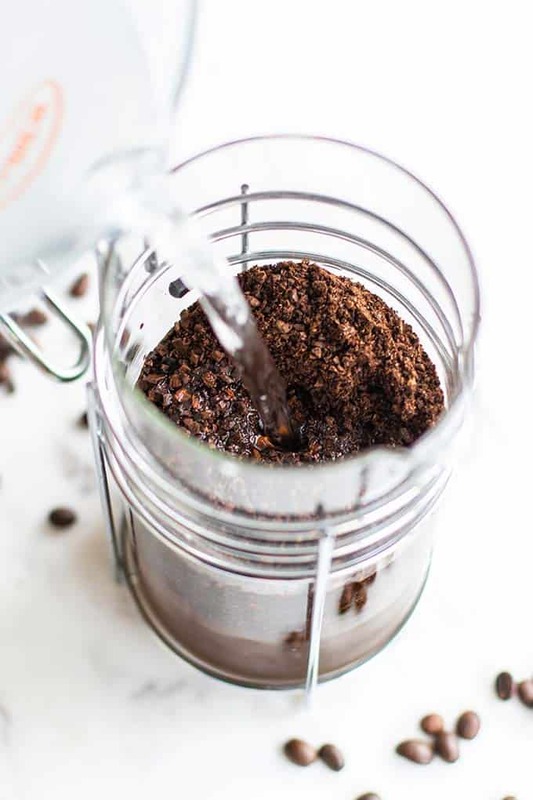 Step 3: Add coffee grounds to a French press, or alternately, a mason jar. Pour water on top of coffee grounds, and then use a long handled spoon to mix the grounds into the water. The grounds will float, but make sure they are all wet. Step 4: Allow the coffee to cold brew in the refrigerator or in a cool space in your house over night or up to 24 hours. Step 5: If using a French press, just press down the handle to strain the coffee grounds, and then the coffee is ready to use. If using a mason jar, I have found using a nut milk bag is the easiest way to quickly drain the coffee and separate the grounds. Cheese cloth also works. Step 6: Enjoy the coffee poured over ice, mixed with milk for a latte, or reheated as a hot beverage. Determining how you will use your coffee will help you decide on the best cold brew coffee ratio. Cold brew is great poured over ice, as a part of a latte, or reheated and enjoyed hot. In a blender or a coffee grinder, coarsely grind beans. Check the photo above to see the texture. It's important to very coarsely grind beans so that the grounds are easy to filter out and your coffee doesn't turn silty. Make sure all beans are broken up, but are in much bigger pieces than you'd typically use. 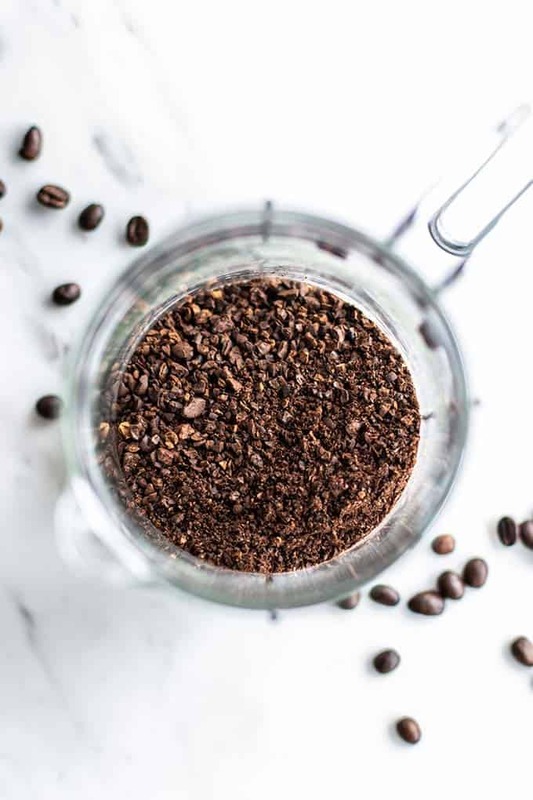 Add coffee grounds to a French press, or alternately, a mason jar. Pour water on top of coffee grounds, and then use a long handled spoon to mix the grounds into the water. The grounds will float, but make sure they are all wet. Allow the coffee to cold brew in the refrigerator or in a cool space in your house over night or up to 24 hours. If using a French press, just press down the handle to strain the coffee grounds, and then the coffee is ready to use. If using a mason jar, I have found using a nut milk bag is the easiest way to quickly drain the coffee and separate the grounds. Cheese cloth also works. Enjoy the coffee poured over ice, mixed with milk for a latte, or reheated as a hot beverage. This Cold Brew Coffee Ratio post contains affiliate links, meaning if you make a purchase, I will receive part of the sale as a comission. This helps me continue to bring you lots of fresh and inspired recipes!